Former IRA members say he was a key figure in the organisation. The Sinn Féin President has consistently denied such claims. THE ISSUE OF Gerry Adams’ relationship with IRA is being raised again, as TV3 prepares to air a new documentary on Sinn Féin. It’s the second time the subject has been placed at the centre the news agenda in the space of less than a month, following the broadcast of a programme on ‘The Disappeared’ by RTÉ and the BBC. That programme contained allegations that Adams “gave the order” for the abduction, killing and burial of widow and mother-of-ten Jean McConville. The Louth TD has consistently said he had “no act or part” in her disappearance. Adams has also consistently denied being a member of the group. However, in the TV3 documentary, entitled ‘Sinn Féin: Who are they?’, former IRA members Anthony McIntyre and Richard O’Rawe contradict the party leader’s stance; both claiming he was a key figure in the organisation. According to O’Rawe, who was public relations officer for the IRA prisoners during the Maze hunger strikes, “Gerry Adams played a leading role during the campaign”. Questioned on the issue by presenter Ursula Halligan, Adams again denies his membership. Meanwhile, Sinn Féin MLA Alex Maskey raises the question of what would happen if the party leader did admit direct involvement. “If Gerry Adams was to come out tomorrow and say he was a member of the IRA, the next question would be: What did you do and when did you do it?” Maskey says. The documentary — which airs in two parts, the first of which will be broadcast tomorrow night at 10pm — also features interviews with Mary Lou McDonald, Pearse Doherty and Martin Ferris; as well as current Government ministers Ruairí Quinn and Alan Shatter. Martin McGuinness speaks of his reluctance to talk about the actions of the IRA for fear it could disrupt the peace process. He tells the programme-makers: ” There is any amount of negative elements out there that would use anything that I say in this interview against the process – I’m not going to give them that luxury”. The broadcast of the documentary follows the controversial proposal from the North’s Attorney General this week that all there should be no more investigations, inquiries or prosecutions of any killings that occurred during the Troubles before the Good Friday Agreement. Speaking on Friday, Gerry Adams said he didn’t think the proposal was a “good idea”. Taoiseach Enda Kenny and Fianna Fáil leader Micheál Martin were also critical of the idea, with Kenny saying he thought the move would be “difficult for families”. 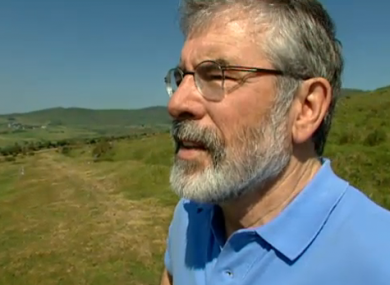 Email “More pressure for Adams as documentary puts issue of IRA membership back in spotlight”. Feedback on “More pressure for Adams as documentary puts issue of IRA membership back in spotlight”.